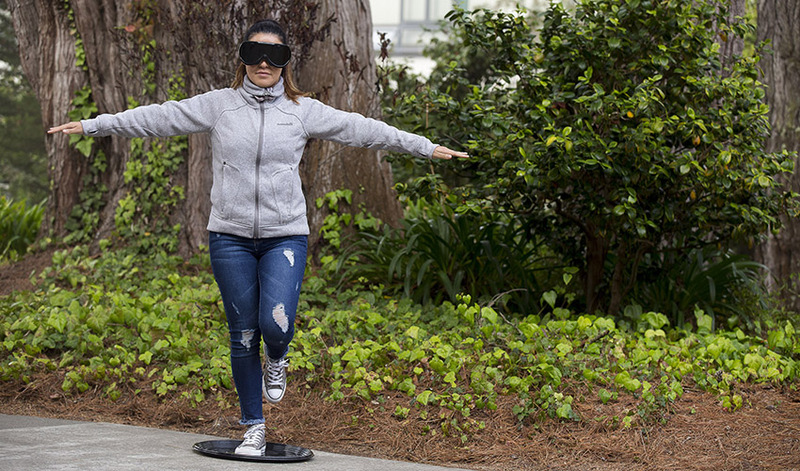 Kinesiology graduate student Tatiana Mariscal tries one of the balancing tests. In a first-of-its-kind study, San Francisco State University Health Equity Institute Associate Professor of Kinesiology Charmayne Hughes and colleagues at the University of Rostock, Germany, found a link between success at specific cognitive processes and seemingly unrelated motor skills — such as balancing on one leg — in healthy young adults. Their findings suggest that people facing physical challenges might be helped by improving cognitive skills — and vice versa. It could lead to new techniques for helping older people with balance issues and children with developmental impairments. Cognitive skills include the ability to retain information, to inhibit certain behaviors, to plan and solve problems and to consider something one way and then change how you think about it as a situation evolves. Motor skills include manual dexterity and activities like driving a car or grasping objects to use for a specific purpose. Hughes and her colleagues put 48 young, healthy adults through a battery of motor-skill and cognitive tests. Motor-skill tests included balancing on one leg on different surfaces with eyes both closed and open; cognitive tests included controlling images on a computer screen and adapting to changing rules in a card-matching game. The breakthrough: Students who performed best on the balancing test also performed best on the cognitive tests. Hughes says her research is preliminary but does show that engaging in certain motor activity programs can likely improve certain cognitive skills — and vice-versa. “This might tell us what cognitive tasks we can train older people on so they don’t lose their ability to balance or their manual dexterity,” Hughes said. Physical therapy to enhance balance often focuses on improving motor skills alone, sometimes with limited results. Hughes says older adults with balance issues might benefit from training on tablets or even video games that improve their cognitive flexibility. “Then we can improve not just cognition but also their balancing ability,” said Hughes. Similarly, children with impaired cognitive skills — such as problems with their working memory — could benefit from physical activities that trigger that part of the brain.